Siberian ginseng, also known as eleutherococcus, is from a different plant family than Korean ginseng and has traditionally been used to combat the effects of stress, fatigue and improve stamina and energy. Used for combating stress and fatigue by building up resistance. A milder gentler supplement than Korean Ginseng. Stimulates the immune system and aids in fighting disease. 15 times stronger than products containing powdered plant material. A considerable amount of scientific work on the chemistry, pharmacology and clinical effects of Siberian Ginseng has been published over the past three decades. As a potent physiological adaptogen, Siberian Ginseng is used to combat stress and fatigue but is more commonly used as a prophylactic agent, a preventive agent taken to reduce the risk of having such symptoms, rather than as a remedial preparation. Unlike Panax ginseng (Korean ginseng), Siberian ginseng does not contain ginsenosides and is therefore regarded as a more 'gentle' preparation. 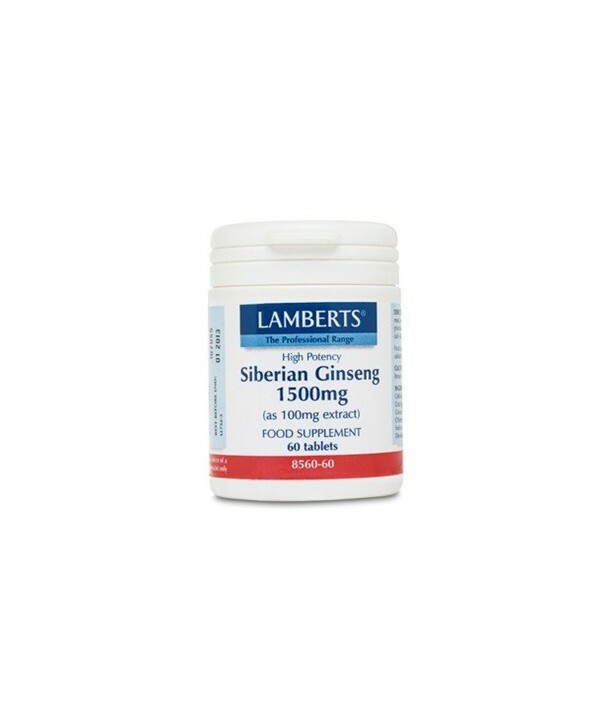 Siberian ginseng is for the prevention of fatigue, stress and anxiety. Korean Ginseng is for those suffering with such problems. 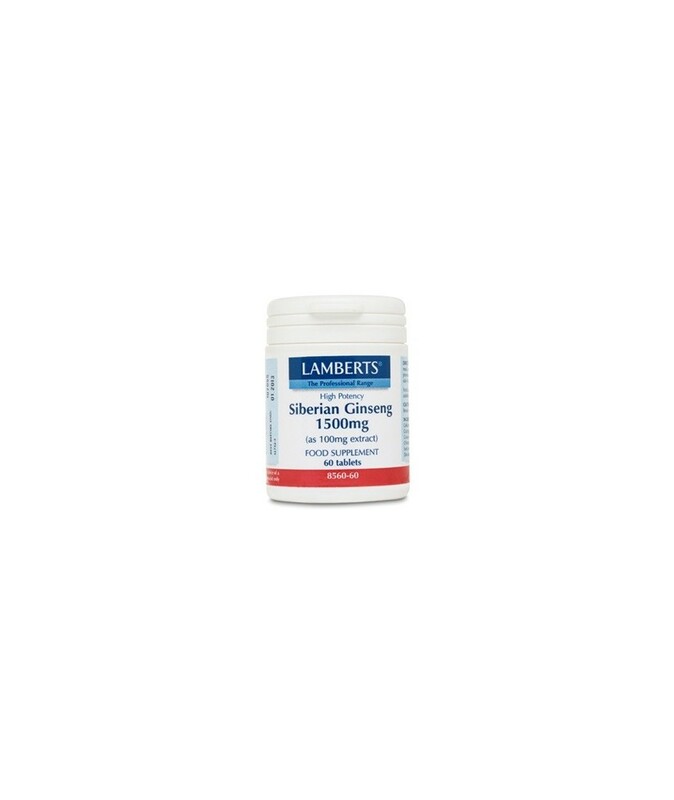 If you require a stronger supplement for a more remedial preparation, try Lamberts Korean Ginseng. Key constitutes of Siberian Ginseng are a large group of active compounds, referred to as eleutherosides, they are thought to stimulate the immune system. These substances are frequently used as markers during standardisation processes. Standardised extracts are favoured by Lamberts since the extraction and concentration procedures ensure that the herbal product is far more potent than those products based on powdered whole herb. Each tablet provides 100mg extract made from over 1500mg of dried herb and is therefore likely to be 15 times stronger than a product containing just 100mg of powdered plant material. Caution: This product is not recommended for pregnant or lactating women. Ingredients per tablet: Siberean ginseng equivalent to (as 100mg of a 15:1 extract) 1500mg, providing Eleutheroside E 660µg and Eleutheroside B 150µg. Tableted with: DiCalcium Phosphate, Cellulose, Tablet coating (Hydroxypropyl Methylcellulose, Colours: Titanium Dioxide & Copper Chlorophyllin, Glycerin), Crosslinked Sodium Carboxymethylcellulose, Silicon Dioxide, Magnesium Stearate, Stearic Acid.